The TRMS professional multimeter PCE-UT71D captivates by its high-resolution display and its high accuracy. Besides the TRMS measurement of voltage and current this professional multimeter is also suitable to measure resistance, condensers, temperature, frequency, etc. According to its modern design the TRMS professional multimeter PCE-UT71D stands out from the crowd of TRMS Multimeter. Apart from measurement value in the main display, the user is shown two additional measurement values in smaller segments. The buttons of the TRMS Professional Multimeter are convincing in their grip and their very good arrangement. Hence the TRMS multimeter is easy to use even for untrained users. 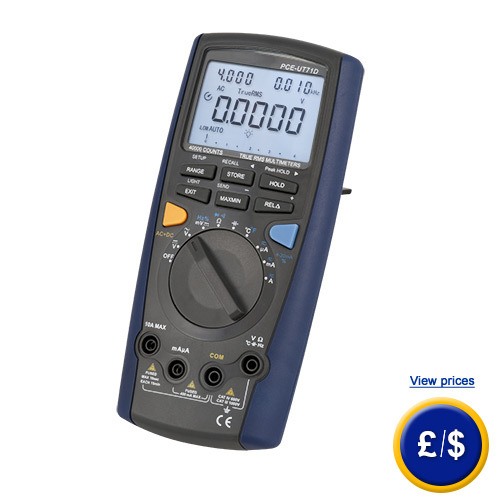 The autorange function of this practical TRMS multimeter supports the intuitive handling. Besides the storage of measurement values the TRMS Professional Multimeter PCE-UT71D can be connected to a PC via optical USB interface. If there are any questions about this TRMS Professional Multimeter PCE-UT71D have a look at the technical specification below or call: UK customers +44(0) 23 809 870 30 / US customers +1-410-387-7703. Our technicians and engineers will gladly advise you in all multimeters and all products in the field of measuring instruments, regulation and control and scales. Note: the thermal element type K (included in delivery) measures temperature until max. 230 °C. 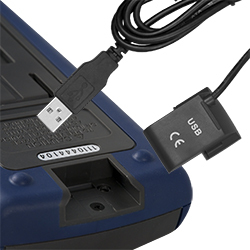 The optical USB interface connects the TRMS multimeter to a PC. The data can be viewed and notes can be taken (both on pc) with the software included in delivery. This offers the opportunity to use measuring data, measured by the TRMS multimeter, for further analysis or documentation at later stage. The optical interface guarantees a galvanic separation between TRMS Professional Multimeter PCE-UT71D and connected pc. Hence it is ensured that possible interference voltage between pc and TRMS multimeter does not have a negative effect on measurement values. 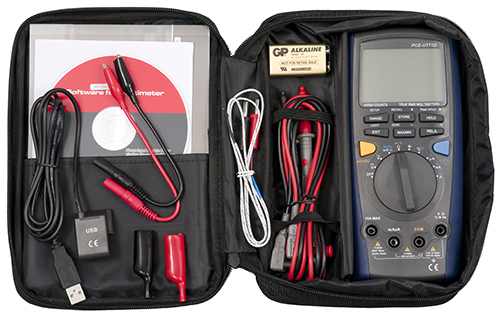 Software of the TRMS multimeter is compatible with every Windows operating system. 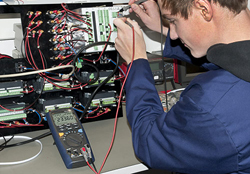 The TRMS multimeter is used to control electric installations before commissioning. So the technician can localize and eliminate potential sources of error in advance. Beside True-RMS until 100 kHz of alternating current and alternating voltage, the TRMS multimeter can also measure direct current and direct voltage, resistance, capacity, frequency, temperature as well as current loop of 4 … 20 mA. The extensive equipment enables the user to measure right from the start. for companies that wish to include the multimeter into their in-house testing lead pool or for annual recalibration. The certificate according to ISO includes a laboratory calibration with certificate of all measurement values. Adapter for indirect voltage measurement until 1000 A without interruption of conductor. Adapter with rotation speed sensor on 1m cable. between 100 … 20,000 RPM (U/min) in two areas. Adapter with pressure sensor on 1 m cable. between 3.5 … 3,500 kPa. Adapter with sound sensor on 1m cable. Adapter with EMF sensor on 1 m cable.